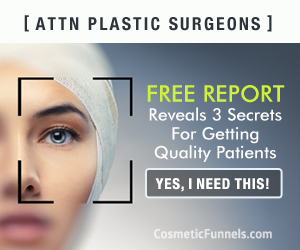 Cosmetic Funnels works with our clients to make you the #1 plastic surgeon in your market for any chosen procedures. With us implementing our “Nano-Marketing Formula” our clients can average 20+ new patients per month, predictably. And depending on the size of the market you’re in, that average can be the number of new patients per chosen procedure. We work with only one practice per 50-100 mile radius so that we don’t cannibalize our marketing. Also, we don’t accept more than 3 new clients per month. This way we keep on-boarding effective, and are able to deliver on our goal of driving new consultations within 48 hours of launching. Licensing Fee: The licensing fee enables you to buy the exclusive rights for your market to a specific procedure. This way if you only care to become the dominant practice for one specific procedure, we’re still free to work with other practices for marketing to different patients. You can license the rights to an unlimited number of procedures. Special rates are available for licensing multiple procedures and for exclusively licensing your market completely. Management Fee: Our management fee is for the implementation and management of our marketing formula for your practice. We take care of implementing everything needed to deliver on our marketing. All your team has to do is take the inbound calls and incoming email leads. We even provide specific follow-up and closing protocols for your team to follow that are proven to convert leads into patients effectively. If you’d like to find out if your area is still available for licensing and see if we’re a good fit for each other, contact us at (949) 200-6775 or with the form below. Note: If you’re looking for a real marketing partner to work with you over the next 3-5 years and support you in dominating your marketing, then talking to us makes sense.